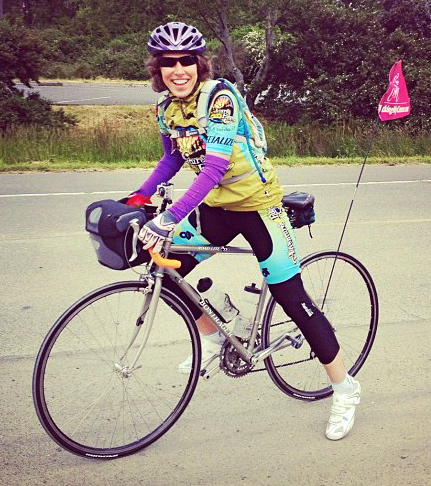 CALIFORNIA – Arcata’s Nicole Nicole will start her breast cancer treatment at Marin General Hospital’s Marin Cancer Institute (MCI) on May 21, and the 41-year-old mother of two is now making a seven-day, 304-mile bicycle journey from her home in Arcata to Greenbrae. She and her husband Garrett have posted a note on the door of their popular organic ice cream shop, Arcata Scoop, announcing she has cancer and that they will be closed for the trip. “The more people that know, the better,” she says. At first she thought her situation was unique but she has since found others who have similar stories. Young, healthy and fit all her life, she had been vigilant about breast health because her mother had breast cancer. Yet as she was breastfeeding her two-year-old one day, she found a hardened region in her breast. Certain something was wrong, she sat down and immediately wrote a letter to her two-year-old and five-year-old telling them about finding the lump. “It was December 27th—I guess I knew from the beginning that it was cancer,” she says. But her doctors weren’t as sure. It was not the first time she had raised a concern, and her primary care doctor told her she did not see anything concerning. Nonetheless, she has pieced together a pattern suggesting the disease had been lurking there for some time. A couple of times when she had been breastfeeding, there had been sudden, inexplicable incidents of pain and illness she attributed to mastitis. They came on suddenly and she was violently sick, yet the next morning she would be fine. Now, she thinks they may have been symptomatic of her aggressive and highly invasive pleomorphic lobular carcinoma, a cancer that starts in the breast tissue, not in the ductile tissue as most breast cancer does, and doesn’t present an easily-noticed hard lump. Despite her doctor’s opinion, Nicole asked for an ultrasound referral. She waited three weeks for the test and another week for the results, a nerve-wracking period since she had seen the technician measuring a large mass on the screen during the scan. Nonetheless, the follow-up letter said she was fine. Nicole went back to her doctor and asked for a referral to a highly respected specialist. It was obvious the specialist didn’t expect to find anything. But when Nicole took her shirt off, the oncologist could see the raised area on her breast. A fine needle aspiration revealed abnormal cells, confirmed by a biopsy performed two days later. It was 14 cm.—more than 5 inches in size. The fact that she was breastfeeding—which often causes irregularities in the breast—and the type of cancer (pleomorphic lobular carcinoma which isn’t easily recognized on ultrasounds and mammograms) had worked against her finding it sooner. Her doctors jumped into action with a plan for using chemotherapy to shrink the tumor, followed by a breast-conserving lumpectomy. Something didn’t feel right; Nicole wanted a second opinion. She called Dr. David Gullion at the Marin Cancer Institute. Twenty years earlier, Nicole had been employed as his son’s nanny. He had treated her mother for breast cancer, and her grandfather for metastatic cancer. She faxed him everything. Dr. Gullion discussed her situation at the next tumor board, a session at which different medical specialists meet to review and discuss the condition and treatment options of patients. “He called me back and said, ‘Even if we shrank your tumor to half its size, it wouldn’t be a candidate for a lumpectomy. You need a mastectomy,’” Nicole says. She and her husband drove down to meet him at Marin Cancer Institute. The minute they walked in, she felt she had found the right place. Dr. Gullion introduced her to Dr. Leah Kelly, a breast surgeon. “She didn’t act like she was my second opinion surgeon,” says Nicole. “She just laid out the plan for my mastectomy and treatment.” Dr. Kelly, Dr. Gullion and their colleagues made such an impression that Nicole and her husband changed their plans almost immediately. Even though it was hundreds of miles away and she would have to move to Marin for part of the summer, she wanted treatment at MCI. Nicole’s sister, a San Anselmo school teacher, mobilized her whole community and offered Nicole and her family a place to stay while she had treatment. “All of a sudden everyone was on the same page,” Nicole says. Even her doctors in Arcata had changed their tune about the lumpectomy, but now Nicole couldn’t imagine having anybody but Dr. Kelly perform the mastectomy. “There was no going back,” she says. The surgery took place almost immediately. Before starting the chemotherapy, she and her husband decided the family should have a vacation together—and Nicole had a brainstorm. They would take a week and instead of driving to Greenbrae from Arcata, she would make the trip by bicycle. Not only would she have a chance to do something she loves, but she immediately saw how it could be used for fundraising and to inspire others. She began lining up sponsors. The money will help fund scholarships for patient and caregivers to access to the programs at the Center for Integrative Health and Medicine, and to support the Humboldt Community Breast Health Project. With her customary energy, Nicole has managed to juggle taking care of her family while meticulously planning her bicycle trip and plans for treatment. She is planning to post video highlights each day of her trip on her kickingmycancer.com blog. Although she hopes to complete the road trip without a hitch, she has agreed to quit if she develops lymphodemea, a swelling of the surgical site that might be caused by road shock and too much exertion after surgery. She’s deliberately avoided asking others to ride with her, because she wants to take it easy each day. Her family will serve as her road crew. But on the Sunday before she starts treatment, four of the doctors from Marin Cancer Center will join her for the 50.8 mile trip from Sonoma Coast State Beach to her sister’s house in San Anselmo. On Monday, May 21, she will ride the four miles alone on the bicycle path from San Anselmo to MCI in Greenbrae. It will be the start of another type of journey. She’s optimistic about its outcome. Day Seven/May 21: 4.0 miles on bike path to Greenbrae to the Cancer Center. Between May 17 and June 15, 2012, Simply Macintosh on the Arcata Plaza will accept entries in a raffle for a 64GB White iPod Touch (4th Gen). All proceeds will be going to support Nicole Nada her family in her battle against breast cancer. Tickets are $1 each or 6 tickets for $5 – available at Simply Macintosh, Adventure’s Edge in Arcata and Essence of Humboldt. This entry was posted on Friday, May 18th, 2012 at 12:53 pm	and is filed under News. You can follow any responses to this entry through the RSS 2.0 feed.